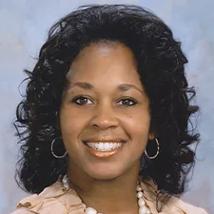 Lenora Foote-Beavers is the Executive Assistant to Presiding Justice Gerald J. Whalen, the first African-American and first Buffalonian to hold this position. She serves as the Chief of Staff for the 4th Department, and handles various court management responsibilities including the analysis of complex court operations, monitoring personnel issues, preparing necessary reports, assisting with budget preparation and allocations, managing and/or overseeing special projects, and monitoring the operations and efficiencies of the three judicial districts encompassing the fourth department. She is also an adjunct professor in the paralegal department at Hilbert College, and teaches family law. Previously, Mrs. Foote-Beavers served as a Support Magistrate with Erie County Family Court for 10 years. Magistrates are responsible for hearing and deciding child support, paternity and spousal support petitions. In addition, she spent 8 years working for the city of Buffalo. During this time she served as an Assistant Corporation Counsel, and was assigned to the housing court and the Buffalo Common Council. She also served as the first Director of the Save Our Streets Program, an initiative that united federal, state, and local law enforcement agencies to tackle the illegal and social problems of drug activity in urban neighborhoods. Lenora also served as General Counsel for the Buffalo Urban Renewal Agency. - Women's Bar Association of the State of NY, "Rising Star"
- Legal Service Award, Minority Bar Association of WNY, Inc.